Jason Andrew Pierre-Paul (born January 1, 1989), nicknamed JPP, is an American football defensive end for the New York Giants of the National Football League (NFL). He played college football for the University of South Florida and was picked by the Giants in the first round of the 2010 NFL Draft. Pierre-Paul was born in Deerfield Beach, Florida to Haitian immigrants who arrived in the United States in 1983. At Deerfield Beach High School, Pierre-Paul lettered in basketball for four years. After a serious leg injury while playing basketball, he took up football his junior year. He amassed 49 tackles, 19 tackles for a loss, 14 sacks, two forced fumbles, one interception and one fumble recovery as a freshman at College of the Canyons (California) and earned First-team All-WSC and All-America honors. In 2008 Pierre-Paul played at Fort Scott Community College (Kansas), where his 70 tackles, 10.5 sacks, three forced fumbles and two fumble recoveries earned him First-Team Little All-American honors. He transferred to the University of South Florida in Tampa, Florida. In 2009, he played thirteen games for the Bulls with seven starts and totaled 45 tackles (16.5 for losses), 6.5 sacks, one interception (returned 18 yards for a touchdown), broke up three passes, and forced two fumbles. He was named First-team All-America by Pro Football Weekly for his efforts, and was also first team All Big East. He earned the nickname Haitian Sensation. In the fourth week of the season, he was named the Defensive Lineman Performer of the Week in the College Performance Awards. After his junior year, he decided to forgo his senior season and enter the 2010 NFL Draft. Pierre-Paul was drafted by the New York Giants with the 15th overall pick in the 2010 NFL Draft. 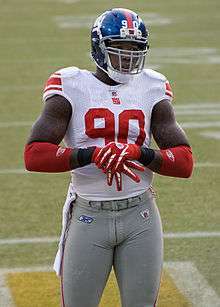 On July 31, 2010, Pierre-Paul and the Giants agreed to a five-year, $20.05 million deal with $11.629 million guaranteed. He made his NFL debut on September 12, 2010 in the New York Giants' season opener, and recorded 2 tackles. He finished the season playing a total of 16 games, totaling 24 solo tackles and recording 4.5 sacks. He was named to 2010 All-NFL Draft Team by Pro Football Rosters. Jason Pierre-Paul on stage at the Super Bowl XLVI celebration ceremony. With injuries plaguing the Giants' starting defensive ends, Osi Umenyiora and Justin Tuck, Pierre-Paul received a significant amount of playing time, including 12 starts. He led the team with 16.5 sacks, and was selected to his first Pro Bowl. Pierre-Paul was also named a First-team All-Pro. He recorded 65 tackles, 16.5 sacks, 1 safety, and 2 forced fumbles during the 2011 season. On December 11, 2011, after already compiling two sacks (one for a safety) and a forced fumble, Pierre-Paul blocked Dan Bailey's 47-yard field goal attempt in the final seconds of the Giants' game against the Dallas Cowboys, and the Giants won 37–34. Pierre-Paul became the first player in NFL history to record a sack, forced fumble, and blocked field goal in the same game. On December 13, 2011, he was named the NFC Defensive Player of the Week. On December 27, 2011 it was announced that Pierre-Paul was voted to his first Pro Bowl, despite not being on the ballot. He played a big role in the Giants playoff run where they competed against the New England Patriots in Super Bowl XLVI and won 21-17. On October 28, 2012 against the Dallas Cowboys, Pierre-Paul caught his first career interception and returned it for a touchdown. Pierre-Paul finished the 2012 season with 6.5 sacks and 43 total tackles. On June 3, 2013, Pierre-Paul underwent back surgery to remove a herniated disc. He did return for week 1 against Dallas, and recorded a solitary sack. Against the Packers, he caught another interception off of Scott Tolzien for another touchdown. Pierre-Paul finished the season with 12.5 sacks. On March 3, 2015, the New York Giants placed the franchise tag on Pierre-Paul. Reports indicated that the tag was non-exclusive, which meant that Pierre-Paul could negotiate with other teams, and the Giants had the right to match any offer, or receive two first-round picks as compensation. He signed a one-year deal with the team on October 27. He was placed on active roster on November 7. On July 4, 2015, Pierre-Paul sustained a serious hand injury in a fireworks accident at his home, and four days later he had his right index finger amputated. On March 8, 2016, Pierre-Paul turned down a better offer from the Arizona Cardinals to stay with the Giants on a 1-year deal worth $10.5 million In Week 12, he registered three sacks including a strip sack that he took back 43 yards for his third career touchdown against the Browns in a 27-13 win. Pierre-Paul was named NFC Defensive Player of the Week for his performance in Week 12. ↑ Bennett, Brian (September 30, 2009). "Pierre-Paul scratching surface of prodigious talent". ESPN. Retrieved December 12, 2011. ↑ Dagger (February 29, 2008). "2010 NFL Combine Results". CBS Sports.com. Retrieved 2010-08-19. ↑ "Giants, Pierre-Paul agree to terms on five-year, $20 million deal" NFL.com, July 30, 2010. ↑ "New York Giants' Jason Pierre-Paul Named to 2010 All-NFL Draft Team by PFR". ↑ "Eli and JPP named to 2012 Pro Bowl". ↑ Youngmisuk, Ohm (December 12, 2011). "Eli, JPP keep Giants' playoff hopes alive". ESPN New York. Retrieved December 12, 2011. ↑ "New York Giants DE Jason Pierre-Paul Named NFC Defensive Player of the Week". ↑ "Jason Pierre-Paul gets New York Giants' franchise tag". National Football League. Retrieved 3 March 2015. ↑ Rosenthal, Gregg (October 27, 2015). "Jason Pierre-Paul signs one-year deal with Giants". NFL.com. Retrieved November 7, 2015. ↑ Patra, Kevin (November 7, 2015). "Giants activate Jason Pierre-Paul; Jon Beason to IR". NFL.com. Retrieved November 7, 2015. ↑ "Report: Jason Pierre-Paul injured in fireworks accident". NBC Sports Radio Profootballtalk. Retrieved 5 July 2015. ↑ "New York Giants' Jason Pierre-Paul has right index finger amputated". ESPN. Retrieved 10 July 2015. ↑ "Jason Pierre-Paul to return to Giants on one-year deal". NFL.com. Retrieved 2016-03-08.